One of the most useful tools a condominium has to plan for the future is the humble reserve fund study. If you’re sitting at your computer, scratching your head and trying to recall just what exactly a reserve fund study is, don’t worry, we’re here for you. A reserve fund study is essentially the process of having a qualified individual (usually an engineer, or someone with similar education and experience) come out to your condo building and do an assessment of all the major components of the building. This includes the roof, building envelope, windows, doors, internal systems, and pretty much anything that’s big, complex, or expensive. From there, projections are made (often over the next 25 years) regarding which of these components will need major repairs or replacements, when they will roughly need to be dealt with, and how much it will cost. Sounds like a great way to plan for the future, right? Well, yes, generally – but there are some caveats and concerns to be aware of, as well. Reserve fund studies are phenomenal tools when it comes to plotting out the course of your condo’s spending and ensuring your board has the budget set aside to tackle known issues as they crop up. They’re also great at shining a light on any sorts of problems that might have gone unnoticed otherwise. 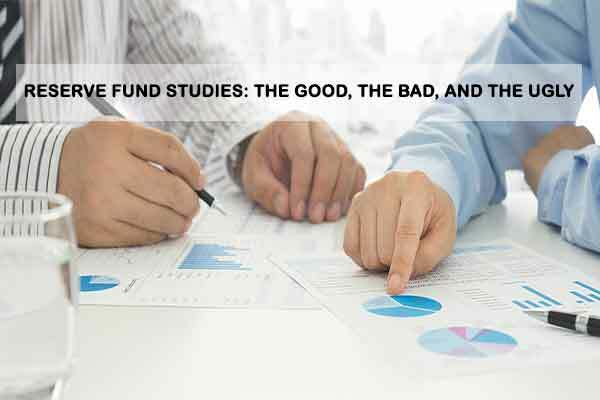 However, a reserve fund study is only useful if it’s accurate – otherwise, you may as well be consulting a crystal ball to plot out your condo’s future. There are a few things you can do to ensure the sort of accuracy that’s necessary. First, make note of any recent major repairs that have been seen to, so that your handy expert knows what he or she should be looking for. If you’re also able to prepare a list of known “trouble spots” (i.e. water marks on the ceiling, foundational cracks, the furnace that spouts jets of flame every now and again, those sorts of things), this will also be handy in helping to identify both current and future concerns. Finally, if you’re able to spend time with your expert during the study, this is helpful too – not only will your inside-and-out knowledge of the building be helpful, but you’ll also be able to take stock of how long your expert stays on site. A comprehensive reserve fund study should take almost a full day, depending on the size of your building. Some may take only a few hours, so your personal knowledge of the building will help them use their time more effectively. Reserve fund study documents are static. Not only that, but they’re rarely adhered to 100%, which can result in inaccurate planning further down the line. This can be tackled by adapting a document that’s malleable, such as a living reserve fund study. Fully-funded reserve? Be careful. Before your new study takes place, take a glance at the work that was outlined over the past five years. Were the tasks completed as they were laid out? If the reserve is full, there’s a good chance they haven’t been – look for justification regarding jobs that were or weren’t handled. Biasing. Sometimes, reserve fund study results aren’t what board members want to hear –especially if they call for a steep increase in condo fees. Take your time when hiring an expert so that you can feel comfortable holding their study as the standard of truth – and don’t let the business side of condo ownership interfere with that criterion. This may seem like a lot to keep in mind, but at the end of the day, if you shop smart for your expert and proceed to follow through on his or her advice, you’ll find yourself with all the navigational tools you need to steer your condo clear of any issues and set a course for smooth sailing for years to come. Do you have questions about your condo’s reserve fund study? Need a hand getting a study set up or finding a qualified reserve fund study expert? Contact us at Catalyst Condo Management today, and we’ll help you safeguard your condo’s future!